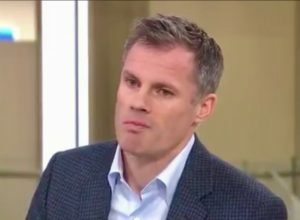 Jamie Carragher has been suspended from his TV punditry work for the rest of the season by Sky after a video emerged of him spitting at a taunting football fan while driving. The incident occurred after Liverpool’s 2-1 defeat against Manchester United at Old Trafford on Saturday, with Carragher shown to have spat in the direction of another motorist. Carragher, who played more than 700 times for the Reds, has carved out a successful new broadcasting career working alongside Gary Neville on Sky Sports, but that now hangs in the balance. Sky held talks with the ex-England defender on Monday following a video coming to light via the Mirror newspaper of him spitting towards a car while being filmed. The other driver’s teenage daughter was said to have been hit in the face by his spittle. Bootle-born Carragher told Sky News that he was “appalled” by his own actions, which he described as “totally out of character”. He said: “You can’t condone that behaviour in any way, shape or form – no matter who you are. It was a moment of madness. It’s the only time I have ever reacted like that. “I called and apologised [to the family] last night. My biggest regret is causing a 14-year-old girl to be involved in something like this. That devastates me more than anything else does. I’ve known Jamie Carragher for 30 years and I can tell you now that incident is completely out of character for him,fair play for phoning the guy and his daughter up and apologising,he’s only human at the end of day and the frustration has got the better of him. On the Carragher “spitgate” I wonder does a reaction like that constitute a moment of madness or unearth a serious character flaw? retaliation with swearing could have been understood, but to spit at anyone surely is the most horrid thing to do.